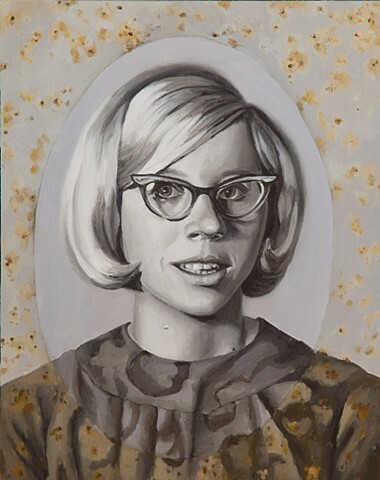 Unwritten History is a painting series of vintage portraits of unknown young women, based on found photographs. When choosing the photographs, I found that I was drawn to portraits from a time period prior to my birth. This is partly because of fashion as well as the absence of color, and also because these women may have been born at the same period as my grandmother, mother, or aunt. Their stories have been revealed to me over the years in bits and pieces, or through a surrogate. Throughout the generations, there is continuity and repetition of similar experiences, not all positive. I imagine that the women I have painted have had similar struggles as myself. For each portrait, I imagined a different narrative for the woman, which is manifested by a depiction of damage to a photograph. This act is symbolic of life experiences changing our self-perception. Whether the damage is caused by natural causes, internal or external forces, the experiences can change who we are even in small ways. Sometimes it discolors or distorts ones perception of our external self. In some cases, that damage feels physical- something that is tangible to a stranger. Even though I may never know who these women are, or what their true stories are, I imagine a kinship with them, and I see their inner beauty and strength.